The latest win by Oliseh's team has seen them return to second spot in the table with 32 points from 16 league games. 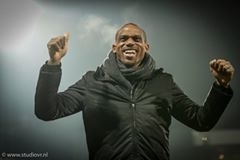 Former Super Eagles Coach Sunday Oliseh is quite delighted, having recorded his 20th win in charge of Dutch side, Fortuna Sittard the hard way in their Match Day 16 clash. His side rallied back from two goals down to defeat Jong PSV 3-2 in a Dutch second division game at the De Herdgang Stadium and Oliseh in a post on his Facebook page late Tuesday night said he was ecstatic with his landmark achievement in such a short period. "Our exceptional 2-3 victory yesterday (Monday) vs Jong PSV, coming back from a 2-0 deficit is my Landmark 20th victory as Coach of Fortuna Sittard after 35 games in charge with 8 draws! God is really Great and working wonders.!!" the elated coach wrote. Fortuna Sittard will face 15th placed RKC Waalwijk in their next home game on Friday.